I purchased this product on a whim. The plates looked simple and cute and I was looking for stay put plates for my 11 month old daughter. She has been feeding directly off the dinner table whenever we dine out. The concept of an edgeless slip-resistant plate seemed like a good solution to tackle the problem of plates that go sliding off the table or plates that are easily lifted off the table only to be thrown to the ground. My husband, the frugal buyer, who questions many of my purchases because I am that good consumer who falls for marketing gimmicks, was skeptical. I did not expect the plates to be slip-proof or lift-proof. I only expected it to be a challenge for my daughter to pick the plate up or slide it across a table and so I set her up with a plate to have my husband’s skepticism squashed. Only that didn’t happen. She immediately picked the plate up at which point my husband got out his iPhone out to record video of her repeating the process. As you can see, it’s not much of a challenge and pretty much no different than a regular plate. This plate may be difficult to pick up when it is sitting on a flat surface, but it isn’t hard to slide. My 9 month old has no problem sliding this plate to the edge of the table, and then picking it up. It makes kind of a loud sound when the rubber on the bottom scrapes against the table, which only encourages her to try to slide it. Nice try, but as a stay-put plate it comes up a little short. 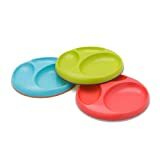 I got these for a two-year old, after getting frustrated watching him try to eat from plates that continued to slide around his little high-chair table. It’s wonderful, doesn’t move at all and it’s harder for him to grip (he likes picking up plates and making huge messes). The only negative was that the plates are too shallow, making it a bit difficult for the baby to scoop his food from the plate.. It sort of slides out the side. All in all, decent plate, very cute, nice colors and delivered on time.